There’s a clash of themes afoot here as the psychedelic 196os meets creatures of the farmyard in Hippie Chicks, an online slot machine from The Games Company with free spins and colossal symbols aplenty – read all about it below. Hippie Chicks is a five reel slot with three rows and twenty fixed paylines; a delicately accessorised frame borders those reels while the backdrop is a scene of 1960s tranquillity with a CND encampment in a green field underneath a groovy sky. There are five high-value symbols and these include the Hippie Chicks logo, two chicks, a guitar-playing chick, an egg and a VW Camper; 10, J, Q, K and A make up the lower values. 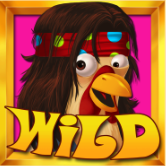 A cheerful chick represents the wild and she will replace all others to help form winning combinations except for the Free Spins scatter symbols. Power to the Reels – a colossal symbol is added to the reels in a random position. it can include wilds and scatters and if you’re lucky it can be big enough to fill all positions on the reel. Give Scatters a Chance – extra scatters are added to the reels for a better chance of triggering the free spins. 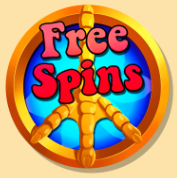 This is triggered by landing at least three of the Free Spins scatter symbols anywhere in view for which you will receive a random number of free spins up to two hundred. The more scatters there are, the better chance of more spins and this is certainly the case if a scatter symbols happen to be colossal. The Reel Chicks will activate their Power to the Reels feature on every spin so there should be some big win opportunities here. This is a theme which appeals to our progressive values but it’s also a well-designed and good-looking slot with lots to offer including a range of bonus features and a very 1960s soundtrack; it comes with an RTP of 96.30%.